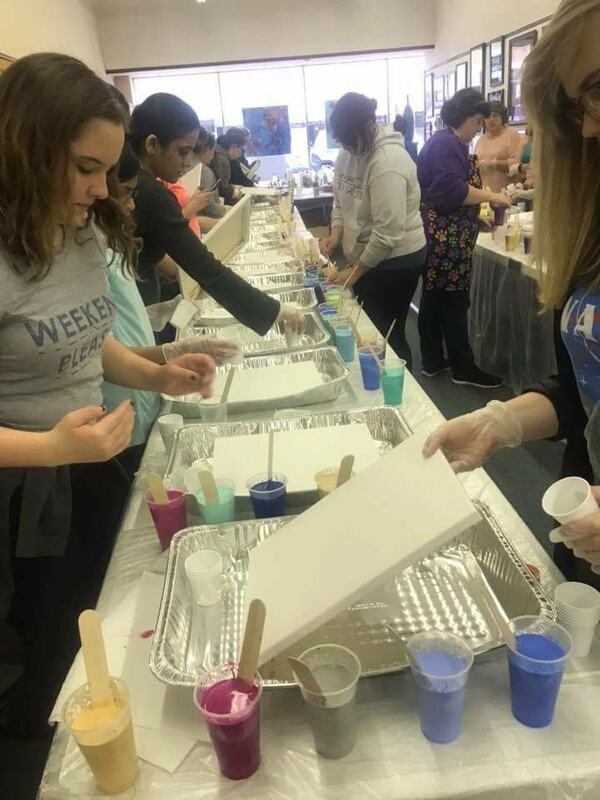 This is a unique event where you can come and create a beautiful abstract painting for your home, office or a gift for a special someone. Consider getting a couple of friends together and each of you can make your own masterpiece. You will be amazed by what you can create….no art experience necessary. Guests are welcome to use all of the acrylic paint colors we have available. You are welcome to bring your own food and beverage (including BYOB). 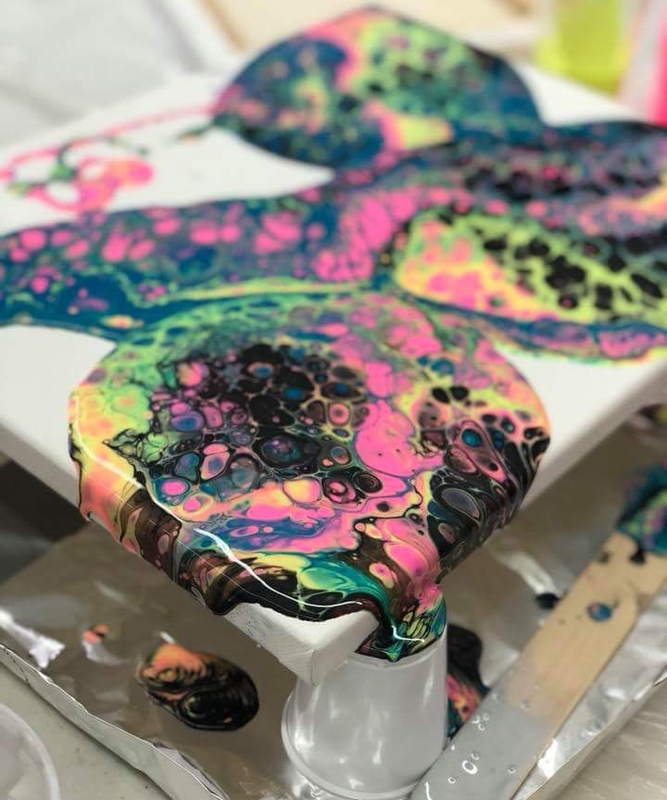 This is a unique event for your group to create a beautiful abstract painting for your home, office, or a gift for a special someone. Consider getting a couple of friends together and each can make your own masterpiece. You will be amazed by what you can create…and there is absolutely no experience necessary. We will provide a delicious light buffet along with several beer selections and our famous homemade sangria. Come join us for an awesome art experience and learn about this fascinating art form. You will be working on a 16x20 canvas and all supplies are included. Cost for the class is $45.00. This is a fun class that promises not to disappoint! You do not need any art experience to be able to create a beautiful statement piece for your home, or a gift for someone special. So call, text or email your besties and sign-up for this fun unique night out! You are welcome to bring cake, goodies and beverages for the event. You are welcome to bring along your own food & beverages. You bring the cake and we provide a light buffet along with our famous sangria. You can also BYOB in addition to your favorite wine offering. This is a unique event bringing co-workers together to create large professional gallery style canvas that may then be hung in your workplace. See how your team’s unique individual talents, when woven together, will create a true masterpiece you can all be proud of. You are welcome to bring your own food and beverages. If you are having us provide a light buffet and non-alcoholic beverages, please add an additional $50.00 to the canvas price listed above. For this option you are welcome to bring your own goodies and beverages. Guests are welcome to use all of the acrylic paint colors we have available. Light snacks and non-alcoholic beverages will also be served. Want to do something fun for your team after hours? This is a good opportunity to host an event everyone can tap into their creative side…and best yet…we do all the work! This is truly an event where you can celebrate your teams creativity, all in a party-like atmosphere. We will provide a delicious light buffet along with several beer and our famous sangria.